I travel a lot and am often asked by strangers on planes what I do for a living. When I tell someone that I lead a company offering vehicle service contracts, I often see the arched eyebrow and skeptical look of a person who is all-too-aware of the unsavory reputation of some of the "bottom feeders" in this industry. When I sense that reaction, I quickly follow up with "But GWC is a GREAT company; we're the best at what we do." When they ask me what makes us the best, I have a ready two-word answer: "Top Talent." Yes, we care about our customers, pay our claims and are incredibly strong financially. But the key that sets us apart is the talent in the field and in our home office in Wilkes-Barre. Specifically, we are the only nationwide vehicle service contract company that employs an all-employee sales team to service our Independent dealers. Our Claims adjusters, contract processors, financial experts and marketing geniuses are all highly trained and committed professionals. And I'm particularly proud of my leadership team, which is the best I've encountered in 25 years in business. We held our company picnic (a blast of a clambake at Konefal's Grove organized by the ever-energetic Jenn K.) a few weeks ago and had a great day filled with music, games, pony rides and casual fun with our work friends and families. As the day wound down, the food servers at Konefal's made a point of letting Jenn know that the children were the best-mannered they had ever encountered at any of the many events they've hosted over the years. A confession: Paul Krugman is one of my heroes. The Nobel Prize-winning economist from Princeton has been consistently right over the years on what is going on in the economies of the U.S. and the rest of the world. Despite an increasingly shrill chorus of deniers, Krugman has patiently reminded people that Keynes was correct, macro economics is a science that has been proven out repeatedly by the data and that we have the knowledge to do the right things when it comes to avoiding economic meltdowns. Unfortunately, since the crash of 2008, attention has been wrongly diverted to the supposed future catastrophe being wrought by deficit spending. Instead, we should be focusing on the current catastrophe being visited on the millions of people who are un- or under-employed due to misguided austerity programs in Europe and the U.S.
Krugman is a reality-based economist in a world that has been overtaken by political shills who would rather win elections than help us out of what is truly a Depression for so many people. 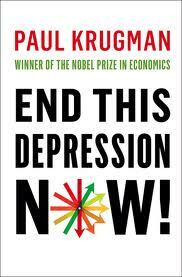 The data is there and in "End This Depression Now" Krugman offers us a pathway out of the current economic mess that is dampening demand and destroying lives. Ignore him at your peril.